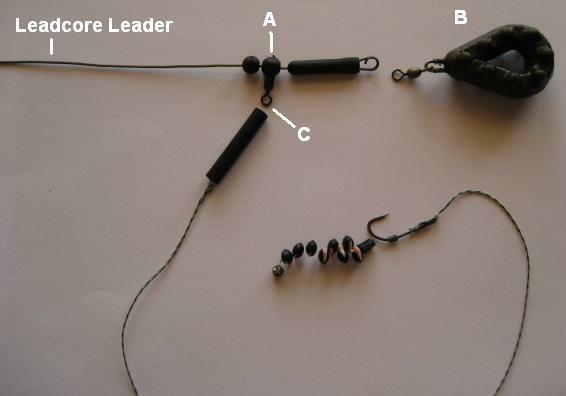 How I set up my helicopter carp rigs onto leadcore leaders. The leadcore weight helps to sink my rigs much faster and keeps the whole set up pinned to the bottom. View how I organize my leadcore helicopter carp rigs by using a quick change system. The special plastic swivel at point "A" has freedom to spin around the leadcore. This allows the hook link to rotate freely during the cast, and virtually eliminates any tangles. You can fix any lead style at point "B". Then push the rubber down in order to cover the clip and swivel. Attach the hook link at point "C", it can be tied on using a strong knot. Although, I prefer to tie a "figure of 8" loop in the hook link, then attach it to a quick release swivel, which then clips on at point "C". I then use the tubing shown in the photo above to slide over these clips so it pushes the hook link away from the leadcore. I prefer clipping on the hook link because it means I can quickly change it at any time during my carp fishing session. I like to use helicopter carp rigs when fishing in soft silt. The lead will sink into the silt and become hidden from any carp approaching the hook bait. The great thing about this carp rig is the hook link will slide up the leadcore as the weight sinks, this means the rig will stay on top of the silt and clearly visible to feeding fish. Because the weight sinks it also means you don't need to use heavy leads, there will still be good bolt effect as the weight requires more pressure to release it from the silt. We have lots of new carp rigs that I guarantee have caught carp in the past. Check out the next links!